Marion Nicholson, first year teacher at Sherbrooke High School in 1906-07, is serious about having a career. She is not focused, like so many of her colleagues, on finding a husband or ‘a pupil of one’ as soon possible. Or so she says in her letters home to her mom. However, Marion’s “strictly private’ pocket diary from 1907 suggests something else: that the young Richmond-born woman is very much torn between her biology and her ambition. In this little brown journal, eighteen year old Marion often comes off like a flighty Scarlett O’Hara type. Marion’s busy social life centers around skating parties at a Sherbrooke rink where she obliges many potential suitors – and turns down some others. That Edwardian winter there are two young men fighting over the ultimate privilege to take Marion home from the ice rink, or the snow shoe club or the local youth hangout: Monty and Gordon. It does get complicated. In the spring of 1907, Gordon takes Marion canoeing. The couple gets caught in a storm on the river and has to take shelter on shore. How romantic! How promising! By the time June rolls around, Marion is getting anxious for the school year to end. It isn’t her work. She is exhausted from all the late nights and ‘dissipation’, as she refers to it in her diary. She returns to Richmond, 30 miles away, to spend the summer with her Mom and sisters. Here, her social activities center on family friends: the Pepplars, the Clevelands, the McCoys, the Sutherlands and the Crombies. In 1907, Richmond is a town without any eligible young men. They have all moved away to find jobs. Marion helps support the family, so she isn’t expected to do work around the house. Most days she is bored silly. She often sleeps in until noon. She sometimes spends afternoons taking ‘crazy’ photos with her Kodak. In Richmond, Marion can go to church, twice a day if she wants. There are frequent afternoon teas hosted by society matrons, daily walks downtown to the mail to see if Gordon has written her, ice cream socials, croquet, tennis, strawberrying and country drives to places like Windsor and Kingsbury by horse drawn carriage. Town tycoon Mr. Wales is the only Richmond citizen who has an automobile, but that will soon change. Yes, it is the summer of 1907 (a year on the cusp of some game-changing technological changes) and the living is far too easy for Miss Marion Annie Nicholson, an energetic young woman who, one day, will lead the PAPT teachers union while supporting four children as a single mom. Even sleepy Richmond, Quebec had its share of scandals 100 plus years ago. Marion did not see much more of Gordon, the son of a wealthy Sherbrooke merchant who would be making a very good salary, 3,000 a year, in 1911 at the age of 26, this according to the Census. Gordon married a friend of Marion’s, it seems. In 1913, Marion married Hugh Blair, the son of a prosperous Three Rivers lumber merchant, although his parents did not favour the marriage because by that time the Nicholsons were broke. Marion’s in-laws did not attend the October wedding at the Nicholson residence on Dufferin in Richmond. Marion’s marriage contract was a nasty piece of work saying she got nothing but the furniture should the marriage break up FOR ANY REASON. As it happens, Hugh died in 1927. Marion was left high and dry cut out of the Blair family business, so she rolled up her sleeves and went back to work becoming a Master Teacher and WWII era President of the Provincial Association of Protestant teachers in Quebec. In the end, Marion did have it all, love, work and family. It just came with some major trials and tribulations. Apparently, she never complained. From 1815 to 1824, an estimated 50,000 Irish immigrants arrived at the Port of Quebec, and 150,000 more arrived between 1829 and 1837. Many kept going, settling in the United States or Upper Canada, but some moved into the rolling hills of Quebec’s Eastern Townships. The region, which is often known by its French name, l’Estrie or Cantons de l’Est, includes Drummond, Richmond, Sherbrooke and Stanstead counties. In order to determine where Irish Catholic immigrants settled in Quebec, I reviewed hundreds of books of marriages, baptisms and deaths in Catholic parishes of Quebec. These books are kept at the Bibliothèque Archives nationales du Québec in Montreal (BAnQ Vieux-Montréal). I also reviewed microfilms there. I did most of this work between 2006 and 2009, and carried out a further review in 2014. Please note: When I identify a church as being an Irish Catholic Church in this research guide, I do not mean to imply that parishioners were mostly of Irish descent. Rather, I mean that, at one point in time, at least 10 percent of the acts of baptism, marriage and death within a particular parish addressed Irish immigrants or their descendants. If you are exploring your family’s history in the Eastern Townships, you may find useful material at the Eastern Townships Resource Centre (ERTC) in Lennoxville, http://www.etrc.ca/ For over 30 years, the ETRC has been a center for the study of the Eastern Townships of Quebec. The ERTC preserves the documentary heritage of the Eastern Townships and serves as a resource for local heritage organizations. The ETRC Archives preserves and gives access to collections that illustrate the development of the Eastern Townships’ English-speaking community. Thousands of documents, such as diaries, letters, minute books, photographs, postcards, maps, plans and audio-visual material, are made available to researchers. It also provides assistance to genealogists tracing their family roots. You can find out how to contact the ERTC at the end of this research guide. The guide includes a brief description of the churches in Drummond, Richmond, Sherbrooke and Stanstead counties that the Irish settlers attended, a list of the cemeteries where many of them were buried, a list of authors, articles and books on the Irish communities of the region, a list of repositories and archives where the records relevant to these communities are kept, and websites that may be of use to family history researchers. I will cover other Eastern Townships region counties in separate posts on Genealogy Ensemble. He looks like one of the clan in the snapshot, with a trim athletic body, a handsome, rugged face, full-lips, sturdy chin, prominent brow over deep set eyes. He is confident in his posture as well as a snappy dresser. He is Dr. Henry Watters of Kingsbury, Quebec and Newton, Massachusetts, first cousin to my husband’s grandmother, Marion Nicholson, the son of her Aunt Christina on her father, Norman’s, side. That also makes him first cousin to Herbert Nicholson, Marion’s older brother. And although the two young men resembled each other in build and facial features, they could not have been less alike! Dr. Henry , by all accounts, was a near-perfect man, a high-achiever, a man who rose to the top of his profession at the Newton Hospital near Boston, but who remained devoted to family (and that includes his cousins) throughout his life. Herb, well, what can I say? As the only son of Norman and Margaret Nicholson of Richmond, Quebec, great things were expected of him. A whopping FIVE dollars was put aside at his birth in 1885 to start a bank account for his future medical career. But, upon graduation from St Francis College in 1905, he went to work as a clerk at the Eastern Townships Bank. A ladies man and/or a gambler, Herbert immediately got into debt, borrowing money off all of his relations, until, in 1910, he got into such a desperate situation that he filched 60 dollars from the till at work. Herbert didn’t go to jail: The Nicholsons were too well connected for that, but even Norman’s patron, E.W. Tobin, the Liberal MP for Richmond, Wolfe, couldn’t help Herbert’s cause. Herbert was forced to skulk out West. His already cash-strapped dad had to come up with the huge sum of 500 dollars to help pay his sons debts and travel expenses. Herbert was a teeny bit ashamed. “Don’t tell anyone where I am,” he wrote to his parents from Saskatchewan, where he was staying with Norman’s former partner in the hemlock bark business. Out West, Herbert worked in a series of jobs in, yes, banking, then insurance, and then with a the farm equipment company, Massey-Harris. At one point he devised a scheme to dupe immigrant farmers out of their hard-earned cash. His other letters home were full of complaints about his workload, the freezing cold weather, etc. – and no shortage of insights into how capitalism works. “You have to already be rich to get rich out here,” he said. Later, Herbert settled down in ‘real estate’ in Vancouver, got married twice to wealthy women, and then moved on to California. He died in 1967, childless. Beside his name in the Nicholson family genealogy it says “Successful Banker.” sic. Dr. Henry ,whose dad, Alexander Watters, was a Kingsbury, Quebec farmer, never married. Henry employed his younger sisters, Christina then Anna, as his housekeeper in his comfortable clapboard Colonial in Newton, Massachusetts. Henry may not have been a ladies man in the usual sense of the word, but he certainly had a way with the young ladies in his family. In the 1910 period, he indulged the Nicholson women no end with trips to Wellesley College in his flashy Stanley Steamer, with sea-bathing at Nantucket, box seats at Red Sox games, theatre plays, and dinners at the posh Windsor Hotel in Montreal, when at home visiting. His younger sister, May, got new shirtwaist suits and fancy hats from him as gifts on a regular basis. Henry once used his vacation time to drive his Aunt Margaret up and down the E.T to visit old friends. And much to his Uncle Norman’s admiration, he paid his own father, Alexander, a trip “home” to the Old Country in 1911. “Not many sons would do that,” wrote an envious Norman to his wife. Unlike Herbert, who found nothing good to say about any of his employers, the banks, the railway or insurance, Dr. Henry never complained about work as a doctor and surgeon in his letters to family, even when suffering from a fatal disease at a relatively young age. Dr. Henry died 1937 and is buried at home, of course, in the clan cemetery in Melbourne, Quebec. Herbert died in 1967 and is buried somewhere in a Long Beach cemetery. His last visit home to Richmond was in the 1920’s. The information comes from the Nicholson Family letters of the 1910 period. The Watters clan of Kingsbury, Quebec is written down as Waters on the 1911 Canadian Census. Henry had a younger brother, William, who died in 1910. A photo on Ancestry claims this 21 year old William is an MD too. He must have been a recently graduated one, or still a student. I have a short obit cut out left by the Nicholsons. It says the family is shocked at William’s death in Montreal, but nothing else. A man could catch a cold and die in a day in those days, but this very short obit suggests something else more nefarious. Below: 1911 census showing Herbert Nicholson living in a boarding house in Qu’Appelle Saskatchewan, with two recent immigrants, one from Germany, one of Scotland (a bartender, no less) and a female (!!!) stenographer. His temperance-minded parents would have passed out, had they known. *This post was originally published on Writing Montreal, my blog. On Sunday, October 1, 2017, some members of Genealogy Ensemble will be participating in the Culture Days event at the Verdun Farmer’s Market, in promotion of Beads in a Necklace, our book of family stories to be published in November. My talk will focus on WWI Victory Gardens and the rising cost of living during that period. The newspaper clipping, above, is from the social notes column of the Richmond-Times Guardian, (Richmond, Quebec) circa 1905. The very silly item about a big potato is probably my husband’s great-grandfather’s way of poking fun at small town pretensions. Or is it? In 1911, with their four children were grown up, the large backyard garden that produced corn, beets, sweet peas, etc., was critical to the diet of this frugal Scottish Canadian family. “I put the Paris Green on the potatoes twice. Mrs. Montgomery came over to tell me that the bugs were eating up my potatoes. I was waiting to get someone to do it for me, as that was one thing I never attempted. 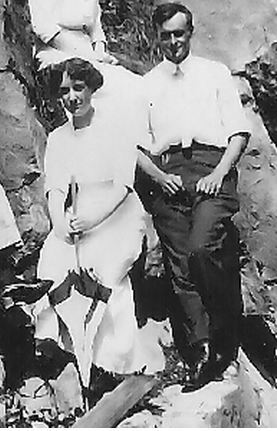 So writes Margaret Mcleod Nicholson, in a July, 9, 1911 to husband Norman, who was away in Northern Ontario working as a railway inspector. In the spring of 1911, it was 57 year old Margaret’s job to care for the garden because her two older girls, Edith and Marion, were away teaching in Montreal, and her youngest, Flora, was very busy studying for final exams. Margaret and Flora were living alone for most of the year. An ‘old-fashioned’ carriage in front of Tighsolas, the Nicholson home, circa 1910. A hire. The Nicholsons couldn’t afford to keep a carriage, let alone buy an automobile, like so many of their neighbours. “We have had dreadful hot weather. Just fancy, one night we slept out on the veranda. Took our mattresses down. The Skinners (other neighbours) were sleeping in theirs so that we were not afraid and we had Flossie (the dalmatian) with us but yesterday afternoon it rained so last night was cool. This sounds like typical Quebec weather, doesn’t it? So up and down. It’s not easy cultivating a garden in this province. It takes perseverance. Marion (who is six months pregnant) then describes how she has hardly slept all week while tending her very sick toddler. She begs her mom to send as many crates of eggs as she can on the next train. It certainly was an era of high-anxiety about food, nutrition – and so many other things. Edith, young Margaret, and Marion, far right, in summer of 1918 in an orchard in Richmond, possibly behind the Nicholson home as they had apple trees. (The newborn is in other pics.) This was the year of the Spanish Flu. It was safer in the countryside. Marion stayed an entire month in Richmond, until her husband, Hugh, begged her to come home in a letter. “The ice in the icebox has melted all over the floor, there’s no food in the house, the windows are kept open and it’s hot as Hades in here. Please come home and take care of me!” He was in the care of his sisters-in-law, who had better things to do in wartime Montreal than to baby their brother-in-law. Edith, a Sun Life employee, volunteered in Soldiers’ Aid for the YMCA and for the Navy League. 1. Most of the famous food brands of the 20th century got their start in 1900-1910 by advertising in magazines like the Ladies’ Home Journal with happy-family lifestyle ads with bigger graphics and fewer printed promises. “Pure” was the adjective of the day. It was understood, even back then, that the home was evolving from a center of production to a center of consumption. Margaret, born in 1853, made everything from scratch, on a woodstove, with recipes she kept firmly locked in her head; Marion Nicholson, born 1886, would cook on a gas stove relying on her Fanny Farmer Cookbook; her daughter, also Marion, born 1917, living in middle class comfort in 1950’s suburbia, would feed her brood nothing but canned vegetables, even canned potatoes, which she warmed on an electric stove. 3. Margaret disliked motor cars. From 1909. “Mr. Montgomery is selling his horse and buying a car. Don’t you think he is foolish?” But, she was happy to go on drives when invited. 5. http://www.thecanadianencyclopedia.ca/en/article/victory-gardens. Apparently, Victory Gardens weren’t only a way to add to the food supply; they were about improving morale on the home-front by making people feel useful. 6. A Chicago Agency sent a very fancy direct mail advertisement out to Richmond homemakers in 1916 on behalf of a new product called Crisco Shortening asking, “Do you like the taste of fresh buns in the morning? Try Crisco.” A coupon was attached.